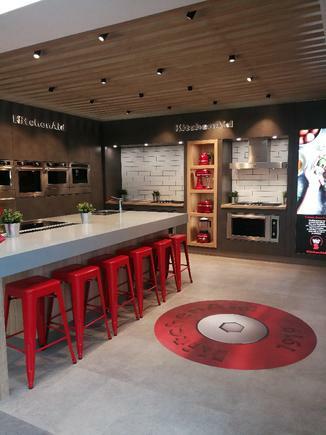 KitchenAid has launched its first experiential store in Melbourne and is planning a national physical retail rollout over the next year to support the launch of its major domestic appliances in Australia. Speaking to CMO following the debut of the new proof-of-concept site in Melbourne, GM of marketing for Whirlpool Oceania, Liam Bryers, described the introduction of KitchenAid’s major domestic appliances locally as a three-year “labour of love” backed by significant retail and marketing investment. Three hero products are initially being introduced from more than 120 SKUs: The Chef Touch sous vide system, Twelix three-in-one oven, and Fjord side-by-side refrigerator. These complement the well-established range of smaller KitchenAid products available locally, such as its iconic and highly popular stand mixer. The Australian launch follows a similar launch undertaken in Europe a couple of years ago and according to Bryers, follows a similar brand and retail strategy. Bryers said the choice of appliances was based on offering a range that is unique, different and offers a compelling story. “We wanted to create and have a story to connect with people passionate about cooking,” he continued. For example, the Chef Touch System allows people to prepare food ahead of cooking, as well as preserve food via its vacuum sealing capabilities. The key element for brand development is physical retail. Through the live demonstration facilities, store visitors can experiment, work with raw materials, bake and experience all the products in one place. Bryers said the idea is to position the full suite of products as one KitchenAid. The wider marketing approach, meanwhile, is again based on the go-to-marketing strategy in Europe. Following on from the Melbourne launch, the company will look to launch similar stores in all major capital cities next year, starting with Sydney, then branch out further depending on their success. Bryers said the ambition was to add 10 stores in 2019, coinciding with the brand’s 100-year anniversary. While online can be a hugely significant component in an appliance brand’s retail strategy, Bryers said furnishing a kitchen is a more lengthy process, involving designers and architects and generally taking 3-6 months to finalise. This makes physical engagement a vital part of the process. “Cooking is touch, feel, it’s texture and how it looks – bricks-and-mortar will always have a part to play in the kitchen, and what we’re trying to do is design a place where people can come in and experiment and try products,” he said. With a small team in this market, most content and assets supporting the major domestic appliances launch locally will come out of Europe. Bryers’ team is also working with the existing local KitchenAid small appliances brand team to leverage its existing customer base for targeted direct mail activities. In the short term, the major domestic appliances will start to appear on KitchenAid’s online and social channels for smaller appliances. “We don’t necessarily need to promote the ‘who’ of KitchenAid, it’s more about articulating that we now have major domestic capabilities and where to find them,” he said. “We’ll be doing a lot about social and brand to let people know there are now larger appliances to match their smaller appliances customers. There’s a ready-made consumer we can start to talk to. Recipes are the cornerstone of how KitchenAid engages with consumers. “If we know someone is interested in recipes, we can tell them about the Chef Touch sous vide system and tailor recipes to suit that way of cooking,” Bryers said. While content will initially be sourced from Europe, there are plans to do replicate Europe’s ‘serious about food’ series for the local market. This initiative is based around a council involving an up-and-coming chef, interior designer and architect who meet regularly to discuss the latest food, kitchen, colour and other design related trends around kitchens. These are put forward to consumers via a limited edition magazine and online content. The emphasis is on recipes that are seasonal, showcase new cooking techniques, or new attachments and are what keep people coming back and re-engaging with the brand, Bryers said. While the customer sweet spot is expected to be existing KitchenAid customers, the launch of KitchenAid’s larger appliances locally rounds out Whirlpool’s wider appliance range, from luxury premium to mass market and value, Bryers said. Whirlpool also owns the Ariston brand aimed at the semi-premium consumer; Whirlpool brand, aimed at mass market; and Indesit, for value-based customers.